Breathing problems are common in a baby born prematurely and oxygen therapy is usually necessary. This is due to tiny air sacs in the lungs not being developed in the same way they would be if born at full term. If a babies’ air sacs are not fully developed when they are born, they may struggle to take in oxygen from the air. Oxygen therapy can play an important role in premature babies’ treatment immediately after birth. 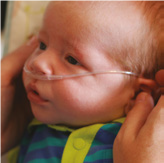 Oxygen for a premature baby, is usually given through a nasal cannula. This is a small tube that fits under the baby’s nose and around their head. 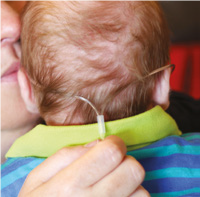 There are two main ways of giving oxygen to a premature baby in their home. 1. Oxygen cylinders: These can be either portable or static. Portable cylinders are small, they allow parents or carers to move around the home or outside the home with baby. Static cylinders are a large cylinder, they are used for babies’ oxygen in the home during the day or while baby sleeps at night. 2. Oxygen concentrator: An oxygen concentrator is a machine that separates oxygen out of the air and gives it to the baby. An oxygen concentrator uses electricity to work. This works 24 hours a day 7 days a week, providing there is electricity supply. A backup oxygen cylinder is supplied in case of power cuts or any unlikely faults with the machine. If you have any questions about home oxygen equipment, safety or the service Baywater Healthcare provide, please call our Healthcare Helpline on 0800 373580 between 8.00am-6.30pm.